The 4th ventricle is a tent-like cavity of the hindbrain lined with ependyma and filled up with cerebrospinal fluid (csf), it’s situated in the posterior cranial fossa in front of the cerebellum and behind the pons and the upper part of medulla oblongata. The cavity of the ventricle seems rhomboidal (lozenge shaped) in the horizontal section and presents a triangular outline in the sagittal section. It’s continuous inferiorly with the central canal of medulla oblongata and superiorly with the cerebral aqueduct of the midbrain. 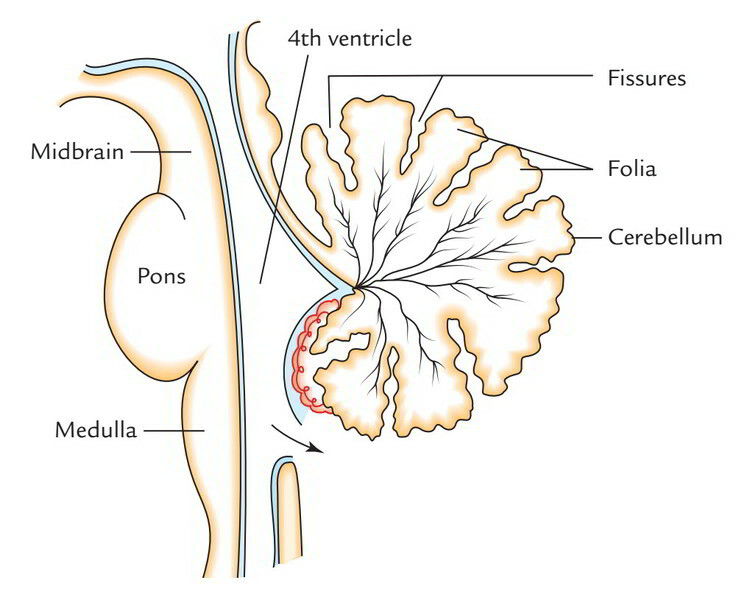 The understanding of the 4th ventricle is important, firstly because it’s strategically set in the middle of critical structures existing in the medulla, pons and cerebellum and second because its roof possesses 3 essential openings which allow the CSF to escape from the ventricular system of the brain to the subarachnoid space. (Lateral Walls). On every side, the 4th ventricle is limted, inferiolaterally by the inferior cerebellar peduncle, sup-plemented by gracile and cuneate tubercles and Superolaterally by the superior cerebellar peduncle. The roof of the 4th ventricle is tent-shaped and has upper and lower sloping surfaces. The apex of the tent goes posteriorly into the white core of the cerebellum. The upper part of the roof is composed by a thin sheet of white matter, the superior medullary velum that stretches between both superior cerebellar peduncles. The lower part of the roof is composed by a thin sheet of non-nervous tissue, the inferior medullary velum that’s created conjointly by the ventricular ependyma and the pia mater. The lower part of the roof is perforated by a midline slit, the median aperture (the foramen of Magendie) via which the cavity of the 4th ventricle interacts with all the subarachnoid space of the cerebellomedullary cistern (cisterna magna). The cavity of the 4th ventricle is prolonged laterally as a narrow lateral recess behind and around the inferior cerebellar peduncle which opens as lateral aperture (foramen of Luschka) into the subarachnoid space in the region of cerebellopontine angle. Via these 3 apertures in the lower part of the roof of the 4th ventricle, CSF escapes from the ventricular system into the subarachnoid space for absorption by the arachnoid villi and granulations. The choroid plexus is a tuft of capillaries that project into the cavity of the 4th ventricle via the lower part of its roof. It gets its blood supply from a branch of posterior inferior cerebellar artery. The whole plexus is’ T-shaped ‘, where the vertical limb of ‘T’ is double with foramen of Magendie intervening between both limbs. The horizontal arm of plexus on each side extends into the lateral recess and protrudes via the lateral aperture, the foramen of Luschka into the subarachnoid space and can be observed on the top layer of the brain, near the flocculus of the cerebellum. The floor of the 4th ventricle is composed by the posterior surface of the pons and the upper part of the medulla. Its rhomboid in shape (diamond shaped) and as a result of its shape, the floor of the 4th ventricle is usually referred to as rhomboid fossa. It’s divisible into 2 parts. 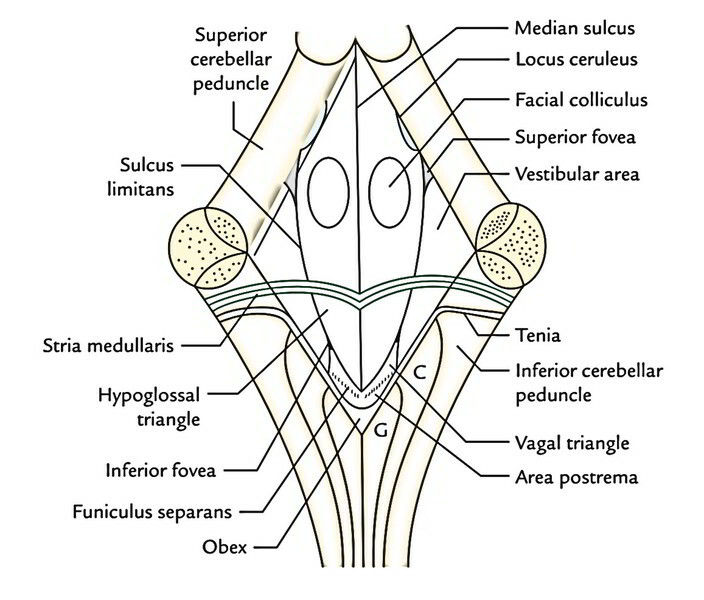 The upper triangular part is jump on every side by the superior cerebellar peduncle, while the lower triangular part jumps on every side by gracile and cuneate tubercles and the inferior cerebellar peduncle. The whole floor is split into left and right symmetrical halves by a median sulcus, which stretches from the aperture of the aqueduct of the midbrain above to the commencement of the central canal below. At its broadest part, the floor is crossed transversely by glistening white fibres, the stria medullaris. These fibres are originated from arcuate nuclei, which come from the median sulcus and run transversely across the floor to goes into the inferior cerebellar peduncle. On either side of the median sulcus, there’s a longitudinal elevation referred to as medial eminence. The medial eminence is bounded laterally by sulcus limitans. At the lateral angle of the floor, the region lateral to sulcus limitans overlies the vestibular nuclei and for this reason it’s referred to as the vestibular area. The upper end of sulcus limitans widens into a triangular depression referred to as superior fovea. Above the superior fovea, the sulcus limitans flattens out and presents a bluish grey area referred to as locus ceruleus. The colour is imparted by the inherent group of nerve cells consisting of melanin pigment which represent the substantia ferruginea. The lowermost part of sulcus limitans presents a small depression referred to as inferior fovea. On either side, the medial eminence presents an oval swelling in the pontine part of floor in the level of superior fovea, the facial colliculus. The swelling is generated by the fibres from the motor nucleus of facial nerve hooking around the abducent nucleus (internal genu of the facial nerve). From inferior fovea, the sulcus limitans descends obliquely toward the median sulcus. This sulcus divides the medial eminence in the medullary part of the floor into 2 triangles: the hypoglossal triangle above and the vagal triangle below. The hypoglossal triangle is split by a vague oblique furrow into a medial part overlying the nucleus of the hypoglossal nerve and a lateral part overlying the nucleus intercalatus. The vagal triangle overlies the nuclei of vagus, glossopharyngeal and cranial accessory nerves. The vagal triangle is crossed by a narrow translucent ridge termed funiculus separans. A small area between the funiculus separans above and the gracile tubercle below is named area postrema. The inferolateral margins of the 4th ventricle are marked by a narrow white ridge named tenia. The 2 teniae meet at the inferior angle of the ventricle to create a small fold referred to as obex. The obex creates the roof of the inferior angle of the 4th ventricle. The term obex is frequently utilized to indicate the inferior angle of the 4th ventricle. The tumors in the region of the 4th ventricle aren’t unusual. The tumors of fourth ventricle are ependymoma and medulloblstoma. The most typical tumor in this region is medullo-blastoma. It appears from the poorly differentiated primitive neuroectodermal cells of cerebellar vermis and takes place mainly in children. The medulloblastoma is highly malignant and generates the signs and symptoms of cerebellar lesions. It might press upon the crucial centers situated below the floor of the ventricle causing cardiac irregularities, tachycardia, irregular respiration and vasomotor disturbances. The ependymoma appears from proliferation of ependymal cells. It can cause obstruction to the flow of CSF which may bring about the formation of internal hydrocephalus.